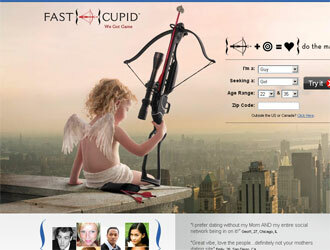 FastCupid.com is a dating site that has affiliations with other social sites. With the help of this site one can find new friends, like-minded people, flirt, casual encounters, romance love and even future spouse. The sign up procedure goes well and simple. There is no need to wait for the profile to be approved before you can start browsing the site and look for that special one. It is frustrating when one cannot get the actual use of this dating site as Standard member until the membership is updated to the higher levels. It is the same with FastCupid.com, though it is said to be oriented on fast dating process. The search for the Standard members is rather limited. The only options to choose from are username, location and age. Standard members won’t find any information about last visit to the site, on-line status and there won’t be paying members in the search results for the Standard members. So, being a Standard member still the choice is very limited. Also, as a Standard member, you cannot view details, on your attempt of doing so, you will be asked to upgrade your profile to the Premium membership. Well, this is not the best way to encourage Standard members getting a Premium membership. Inability to read more about the members and watch their additional picturea is a major turn off for Standard members to upgrade their profiles to a higher level. New member communication, the management of sites, profiles and photos is also far from welcoming. FastCupid.com allows standard members have free success to the options like ‘hi’ and ‘flirts’ interest indicators. However, one won’t go further than that with the Standard membership. The range of features is rather poor at FastCupid.com: you won’t find here any chat-rooms, no ability to build any membership through activities, no matchmaking services and no instant messengers. These all can be found on the rival dating sites and people of the present age are used to these features, making communication interactive, fun and interesting. Being a Standard member, you will also face the problem of e-mail restrictions. Their list of features is rather short for the dating website of today. FastCupid.com fails to make its members feel a community. There are no features to unite its members into a community and feel as a part of a big ‘family’. The lack of profile options just increases the isolation of each member registered on this site.